A long item for its form at 6 1/2", and heavier feeling than its .9 T. oz. 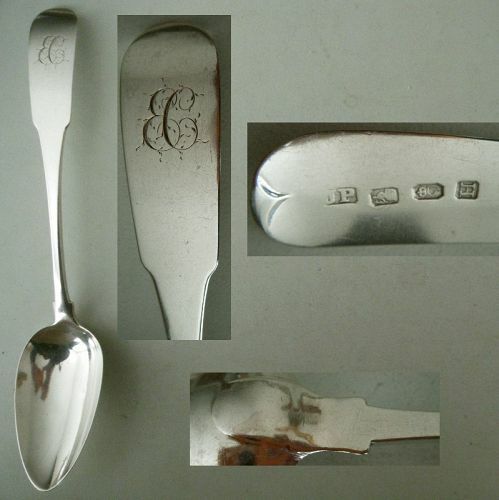 actual weight, this coin silver cream or sauce ladle traces to the second quarter of the 19th century. It is marked "Boynton & Woodford for the Boston retail partnership with dates 1837-54. The "Tipt" end pattern places it toward the earlier end of those years. A graceful piece, the handle is arced with an upturned terminus. The plain, well-formed, bowl is ovoid at 1 7/8" by 1 1/2" by 7 1/16" deep. " 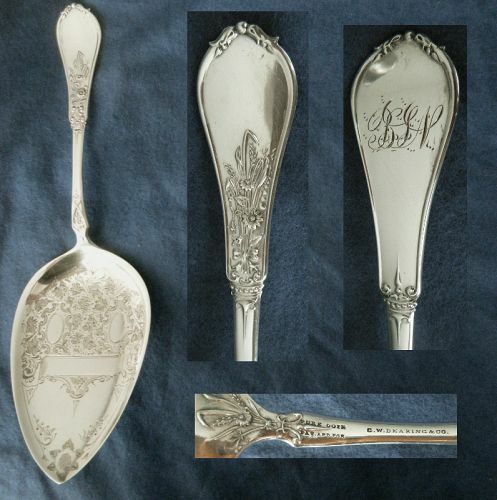 This mid 19th century, coin silver berry or serving spoon measures 8 11/16" long and weighs 1.4 T. oz. It has a broad, "Tipt" end, high shoulders off the bowl, and a generously proportioned, 3" long by 1 7/8" at the widest, scallop shell bowl. There is a fancy, feathered script "HMM" monogram on the front of the handle.